Emperor Taishō (meaning "Great Justice") was the name given to Yoshihito at the time of his coronation. 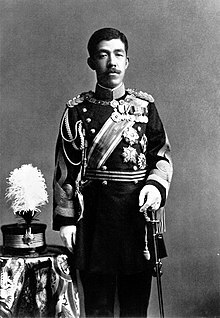 Emperors of Japan receive a new name at the time of their coronation, and people start using the new name, both to refer to the emperor himself and the name of the era during which he reigned. ↑ Imperial Household Agency (Kunaichō), 大正天皇 (123); retrieved 2011-10-16. ↑ 3.0 3.1 Nussbaum, "Taishō Tennō" at p. 929. ↑ Nussbaum, "Meiji Tennō" at p. 624. ↑ 5.0 5.1 Nussbaum, "Hirohito" at p. 318. ↑ 6.0 6.1 Nussbaum, "Shōwa Tennō" at p. 889. ↑ Hammer, Joshua. (2006). Yokohama Burning: the Deadly 1923 Earthquake and Fire that Helped Forge the Path to World War II, p. 43-44.